Because Eleshia and David had family arriving from all over the world for their wedding, they wanted their celebrations to last more than just one day. So to give their guests a taste of the real Andalucia we planned a spectacular pre-wedding party two days before in a courtyard venue in Marbella. There, forty guests enjoyed a typical flamenco show and a vast array of home cooked tapas and local produce. It was a great way for everyone to meet each other and get the celebrations started. The following day was the Stag and Hen night out in the surrounding Marbella and Puerto Banus nightclubs and bars, then after just one day of recovery, their wedding day had arrived. Eleshia was a picture of perfection in her elegant lace dress and her hair styled long and flowing with fresh flowers in it. Her bridesmaids wore long blush dresses and the bouquets continued the relaxed but luxurious wedding style, with rustic wild flowers in tones of lilac, pink and white. The ceremony was held in a beautiful gazebo, bedecked in wild flowers, looking out to sea. Eleshia walked down the aisle accompanied by the sounds of Spanish guitar and David’s sister Joanne singing beautifully and the service was conducted by the ever-enigmatic Padre Peter. The 80 guests were then led back to the terrace to enjoy sea-view drinks followed by the wedding breakfast. Our wedding providers really surpassed themselves helping create Eleshia and David’s dream beach wedding – with a spectacular starfish-themed peach and cream cupcake tower and a hand-made unique driftwood seating plan complete with shells and pebbles. The party continued on the beach, which was strewn with tiny candles in the sand, and guests danced the night away as the sun set over the mountains. And Eleshia and David? 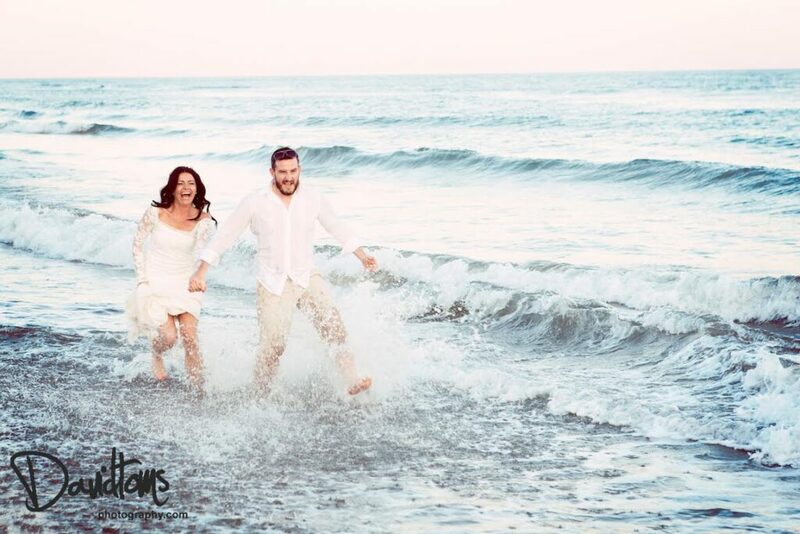 They ran through the sea, hand in hand, loving every second of their special Spanish wedding. This has got to be the most fun way we have seen a couple end such a fantastic week of celebrations. Congratulations, Eleshia and David, and thanks for being so great to work with!